We are pleased to offer you the services and support you need to live comfortably and independently at home. Together with our service partners, Circle of Care is committed to respecting your rights as a client and helping you understand and exercise those rights. The rights of our clients are based on the Ontario Bill of Rights. Be treated in a courteous and respectful manner. Be informed about the services provided. Participate in decisions regarding the plan of service. Have personal, medical, and financial information treated confidentially. Consent or refuse consent to the provision of any service. Express individual preferences including ethnic, cultural, and spiritual values. Express concerns or complaints without fear of reprisal. Consent to the provision of any service. Inform Circle of Care as soon as possible of any and all changes affecting service. Provide all required information to prepare an appropriate plan of service. Treat Circle of Care personnel with courtesy and respect. Respect the individuality, ethnic, cultural, and religious values of agency personnel. Accept the scope and limitations of the services provided by Circle of Care personnel. Our agency is committed to meeting your needs and providing you with exceptional care. As a Circle of Care client, we wish to ensure that your voice is heard while receiving our services. As a client or caregiver, you have the right to let us know how you feel about the quality of care we provide. Circle of Care invites you to call the agency at any time to speak with your Coordinator or Client Services Supervisor. Let them know how you feel about our services, or if you have a particular concern or compliment. This is an opportunity for us to learn how we can better meet your needs, and to ensure we consistently fulfill our promise of delivering the highest quality of care. Your information will be shared with staff providing service, as well as other organizations involved in your care. This information cannot be used for any other purposes without your permission. Client privacy is a top priority at Circle of Care. We collect clients’ personal health information under the authority of the Personal Health Information Protection Act, 2004 (PHIPA). All Circle of Care staff and volunteers sign a confidentiality agreement and are educated on protecting client privacy and compliance with Ontario’s privacy legislation. In addition, strict security and audit controls are in place to ensure your information is viewed only when required. If you would like to know more about how your personal health information is handled and shared please call 416-635-2860 and ask to speak to the Privacy Officer, or read our page about Privacy. For more information about your privacy rights, or if you were unable to resolve a problem directly with our agency, contact the Privacy Commissioner of Ontario at 416-326-3333 or 1-800-387-0073. Care that is funded by the government or a third-party agency is based on an in-person assessment of needs. If your needs have changed over time, please contact your Client Services Supervisor (CSS) who can assist you in contacting the appropriate organization. At any time, clients may also choose to pay for additional hours. For current service rates, call 416-635-2860. If you are awaiting the arrival of your PSW, please remember that your visit has been scheduled to allow your PSW to arrive 15 minutes before or 15 minutes after the appointment time. Many of our PSWs depend on public transportation to get to client visits, so this window provides flexibility for their safe arrival. Circle of Care offers a variety of services and supports to help you live independently at home, including: Personal Support, Exercise & Fall Prevention Classes, Transportation, Kosher Meals on Wheels, Day Centre for Seniors with Alzheimer’s & Dementia, Caregiver Support and Visiting Hospice. Call us at 416-635-2860 to learn more. We believe the cost of care should not be a barrier to getting support that is needed. For those who are eligible for government-funded care, a number of our services can be obtained at no cost through agencies such as the Local Health Integration Network (LHIN), or the City of Toronto. There are also supports and services available for eligible Holocaust survivors and veterans. We can help you find your way, and advocate on your behalf to access these benefits. Do not let concerns about cost stop you from inquiring about services. Please contact us to find out about how you or your loved one can afford to stay at home. Services and programs including Personal Support, Kosher Meals on Wheels, Transportation, and Adult Day Program are generally not provided on statutory holidays. In some situations, exceptions to this rule may be made depending on the complexity of a client’s needs. In 2005, the government of Ontario passed the Accessibility for Ontarians with Disabilities Act or “AODA”. It is the goal of the Ontario government to make Ontario accessible by 2025. The Integrated Accessibility Standards Regulations (“IASR”) under the AODA, require that Circle of Care establish, implement, maintain and document a multi-year accessibility plan which outlines the Agency’s strategy to prevent and remove barriers for people with disabilities and to meet its requirements under the IASR. Circle of Care is committed to treating all people in a way that allows them to maintain their dignity and independence. We believe in integration and equal opportunity. Circle of Care is dedicated to fostering an inclusive environment for our employees, clients and volunteers. Ensuring equal access and participation for people with disabilities. Meeting the needs of people with disabilities in a timely manner. Meeting our accessibility requirements under AODA. Keeping track of upcoming visits and monitoring services provided to a loved one has never been easier! 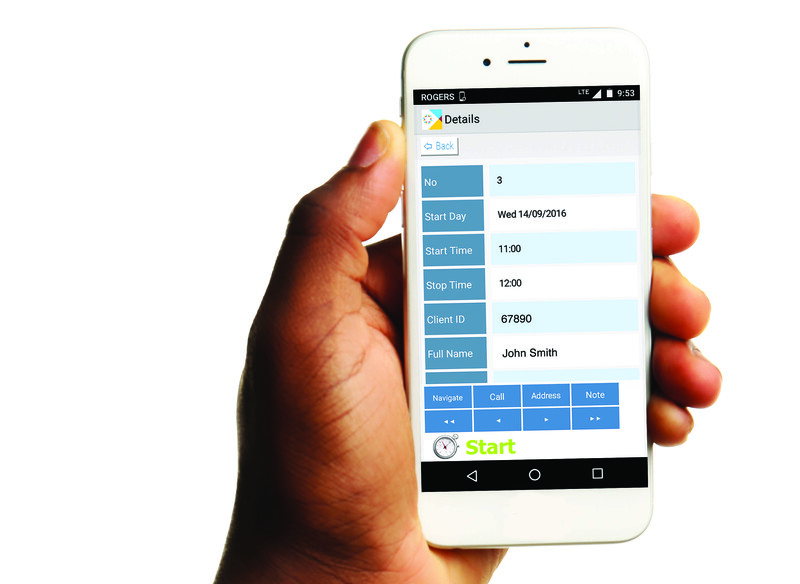 Our new app, MyCofC, allows clients or family members to securely log in from any Apple or Android smartphone or tablet. Users can view scheduled visits and also track the status of visits and services as they happen – added peace of mind for caregivers who live a distance from their loved one. Download the free app, then call 647-943-1332 to activate your account today! Strengthening the voices of patients and families in their own health care planning is one of the tenets of Ontario’s Patients First legislation. Our recently launched Client and Family Caregiver Advisory Council was designed to gather feedback, perspective and collaboration from clients and family members that will help drive quality improvement within our organization. Unsure about how to respond to a spouse, parent, or grandparent with dementia? 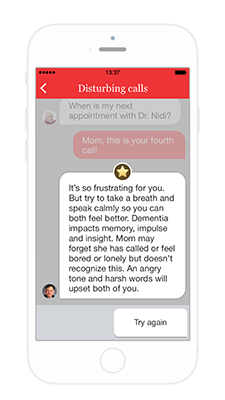 The Dementia Advisor App, developed by Sinai Health System’s Reitman Centre, is a mobile app that helps family caregivers learn how to deal with difficult situations, improve communication, and gain problem solving skills. It can be downloaded for free for both iOS or Android devices. Sinai Health System’s Healthy Ageing and Geriatrics Program is at the forefront of leading and innovation in the care of older Canadians. Our affiliation with Sinai Health System gives us access to this remarkable resource. The Older People’s Education and Navigation Strategy (OPENS) initiative seeks to provide reliable information to older adults, caregivers, families, and health care professionals on topics that lead to healthy aging. Click each box to explore these resources.